According to the industry analyst, IDC, Xerox is now number 1 in the United States and Canada for total shipment value share of copiers, printers and multifunction printers for the 2nd quarter of 2018! Xerox is also number 1 for share of managed print services. 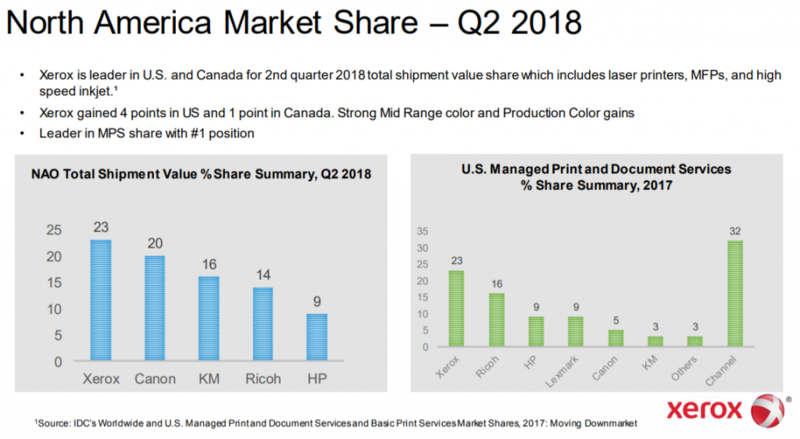 Xerox Partners, like JustTech who use Xerox Partner Print Services for managed print fulfillment are included in the Channel column below which boosts Xerox’s share even more in the share of managed print services.